WASHINGTON – US President Barack Obama held a festive Hanukkah reception at the White House on Thursday and appeared to be in a particularly cheerful mood. Among the guests were his wife Michelle, Vice President Joe Biden, Israeli ambassador Michael Oren and Supreme Court Justice Ruth Bader Ginsburg. "The story of Hanukkah is one of right over might, of faith over doubt," he remarked. Getting into the holiday spirit Obama was brimming with jokes and good wishes. "We’re jumping the gun just a little bit," he noted. "The way I see it, we’re just extending the holiday spirit. We're stretching it out. But we do have to be careful that your kids don’t start thinking Hanukkah lasts 20 nights instead of eight." Addressing the US's ties with Israel he said: "This is also a time to be grateful for our friendships, both with each other and between our nations. And that includes, of course, our unshakeable support and commitment to the security of the nation of Israel." Obama seemed particularly jovial as he said, "So while it is not yet Hanukkah, let’s give thanks for our blessings, for being together to celebrate this wonderful holiday season. And we never need an excuse for a good party." He later noted, "We can't wait to give you a hug and a kiss and wish you a happy holiday." Addressing the miracle of Hanukkah, the President said: "This Hanukkah season we remember a story so powerful that we all know it by heart - even us Gentiles." He added, "And for 2,000 years, it has given hope to Jews everywhere who are struggling." After the reception the guests assembled at the Library of Congress where Chairman of the Democratic National Committee Debbie Wasserman Schultz held a party for Congress members. During this event Ambassador Oren reounted a phone call he received from Prime Minister Benjamin Netanyahu as he was heading to the Hanukkah reception in the White House last year. Netanyahu had asked Oren to approach Obama and seek his help in containing the Carmel fire which was threatening to reach Haifa at the time. The ambassador related how in a private meeting at the Oval Office President Obama ordered aid to be sent to Israel noting that eight of 11 fire extinguishing that the US had sent Israel were dispatched that very night. 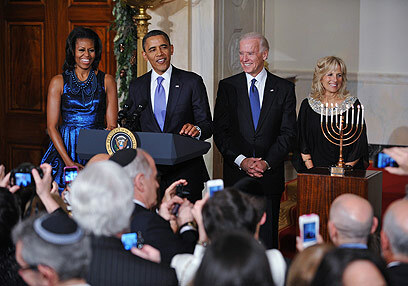 See all talkbacks "Obama celebrates Hanukkah in White House"